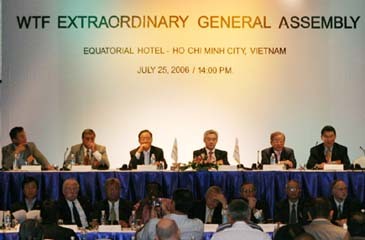 WTF President Chungwon Choue chairs the WTF Extraordinary General Asembly at the Equatorial Hotel in Ho Chi Minh City, Vietnam, on July 25, 2006. Ho Chi Minh City, Vietnam – The World Taekwondo Federation designated Sept. 4 as the official "Taekwondo Day" at its extraordinary General Assembly here on July 25, 2006. In line with the WTF's ongoing reform programs, the General Assembly approved a package of proposals for amendments to the WTF Rules and Regulations and the WTF Poomsae Competition Rules. Under the changed WTF Rules and Regulations, the term "regional" will be changed into "continental," thus the regional taekwondo unions shall be continental taekwondo unions. Article 2.4 on Amateurism was also deleted to help activate professional taekwondo. The WTF Executive Council will be renamed into the WTF Council, with the creation of the Executive Committee consisting of the president, six vice presidents, the secretary general and the treasuer. Under the new WTF Rules and Regulations, the General Assembly shall be held every year at the same location where the WTF World Taekwondo Championships and the WTF World Junior Taekwondo Championships. The fiscal year of the WTF shall commence on Jan. 1 and end on Dec. 31 of each year. The General Assembly also approved the creation of the Paralympic Committee within the WTF, in line with the WTF's policy to include taekwondo in the official sport of the Paralympic Games in the near future. In a show of solidarity among the global taekwondo family members, the General Assembly adopted a resolution on recent terrorist incidents in Iraqi, condemning the kidnapping of Iraqi taekwondo athletes two months ago and wishing them an early return to their homes. The Assembly approved three new memberships: Kiribati in the Oceania region and Zambia in Africa as full members, along with Isle of Man as an associate member. With the new memberships, the WTF has a total of 182 member national associations. At the Assembly, Izmir of Turkey was chosen as the host site for the 7th WTF World Junior Taekwondo Championships on May 8-11, 2008, with Incheon of Korea the venue for the 2nd WTF World Poomsae Taekwondo Championships in the fall of 2007. On July 24, the WTF's Executive Council approved the new referee uniforms for Kyorugi and Poomsae competitions. At the Council meeting, Manchester of Great Britain outbid Baku of Azerbaijan to win the bid to host the World Olympic Qualification Tournament. On a more heartwarming note, the Pakistan Taekwondo Federation offered its heartfelt appreciation to the WTF for offering condolences and monetary support to the National Olympic Committee of Pakistan during the devastating earthquake that struck Pakistan on October 8, 2005. The WTF was the only federation that offered such support. The 6th WTF World Junior Taekwondo Championships will start on July 26 for a five-day run at the Phu Tho Indoor Stadium in Ho Chi Minh City. The biennial event drew more than 1,000 athletes and officials from over 75 countries. Expresses its reinforced determination to combat all forms of violations against human rights and the Olympic Movement through the sport of taekwondo.